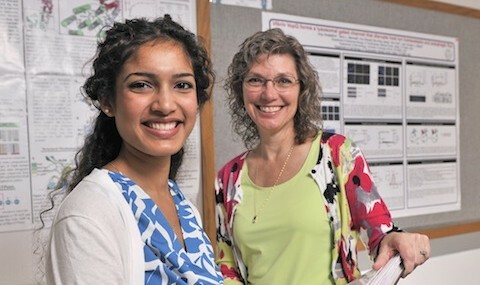 Graduate student Anju Sreelatha (left) and Dr. Kim Orth, professor of molecular biology and biochemistry. Vibrio parahaemolyticus bacteria, which cause gastroenteritis, inject proteins called effectors into host cells. One of those effectors, VopQ, almost immediately starts to disrupt the important process of autophagy via a novel channel-forming mechanism, the scientists report in the investigation available online at the Proceedings of the National Academy of Sciences. Autophagy is the cellular housekeeping mechanism used to recycle nutrients in cells as well as to fight off pathogens. The term autophagy comes from the Greek words for self and eating. During the process, nutrients are recycled by the lysosome, an internal organelle, to produce metabolites that can be used by the cell. “Our study identifies a bacterial effector that creates gated ion channels and reveals a novel mechanism that may regulate autophagy,” said Dr. Kim Orth, professor of molecular biology and biochemistry. She is a corresponding author on the published study. The first author is Anju Sreelatha, a graduate student in Dr. Orth’s laboratory. “Disruptions of autophagic pathways are implicated in many human diseases, including neurodegenerative disease, liver disease, some cancers, and cardiomyopathy (heart muscle disease),” Ms. Sreelatha said. She explained that ion channels are pores in the membranes of cells or of organelles within cells that allow regulated passage of small molecules or ions across membranes. Gated channels have a mechanism that opens and closes them, making these proteins potential targets for drug development. “The identification of a channel that opens and closes and thereby affects autophagy may give us a handle by which to modulate this important process,” she said, adding that the researchers found that VopQ’s channel activity turned off autophagy. “During infection, VopQ is injected into the host cell where the protein binds to a lysosomal membrane protein and forms small pores, all within minutes of infection. The resulting complex of proteins causes ions to leak and the lysosomes to de-acidify. Lacking acidification, lysosomes cannot degrade the unneeded cellular components and autophagy is disrupted,” Ms. Sreelatha said. Further characterization of the mechanism by which VopQ sabotages cells to disrupt autophagy may lead to a better understanding of host-pathogen interactions as well as advance our understanding of the pathway, eventually leading to new treatments for diseases in which autophagy has gone awry, they noted. Other UT Southwestern scientists involved were Dr. Hui Zheng, a postdoctoral researcher of cell biology, and Dr. Qiu-Xing Jiang, assistant professor of cell biology. Also participating were Terry Bennett and Dr. Vincent Starai of the University of Georgia. Funding was provided by the National Institute of Allergy and Infectious Diseases; the Burroughs Wellcome Foundation; the Welch Foundation; the National Institute of General Medical Sciences; the Cancer Prevention and Research Institute of Texas; and by University of Georgia Startup Funds. UT Southwestern, one of the premier academic medical centers in the nation, integrates pioneering biomedical research with exceptional clinical care and education. The institution’s faculty has many distinguished members, including five who have been awarded Nobel Prizes since 1985. Numbering more than 2,700, the faculty is responsible for groundbreaking medical advances and is committed to translating science-driven research quickly to new clinical treatments. UT Southwestern physicians provide medical care in 40 specialties to nearly 90,000 hospitalized patients and oversee more than 1.9 million outpatient visits a year.